The Eternal Warrior is a character in Valiant Comics who is an immortal from Ancient Sumer that has fought in a multitude of wars over the past millennia. Considered to be one of the greatest warriors of Earth, Gilad works for Earth itself by destroying threats pointed out by Geomancers. 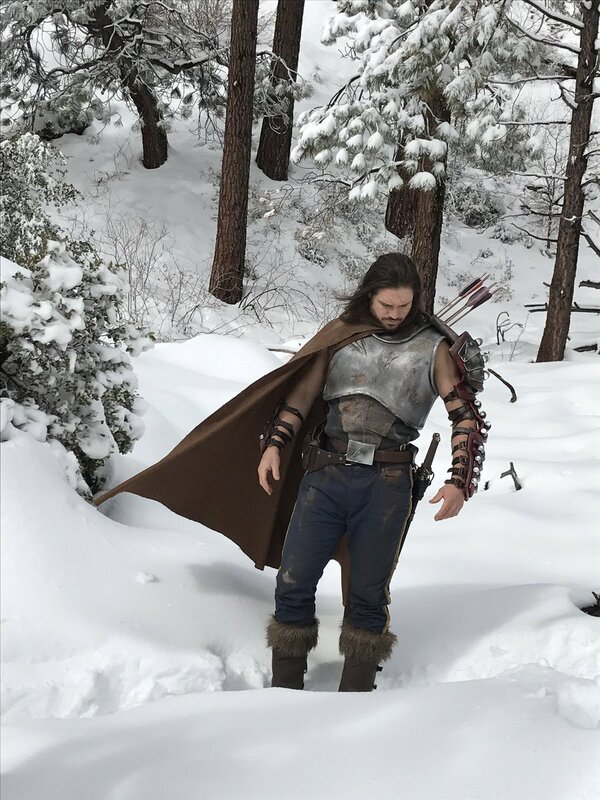 Actor John Morrison will played the Eternal Warrior in the live action web series Ninjak vs the Valiant Universe. Dave Bautista is set to play the Eternal Warrior in a planned film by SONY and Valiant. Enternal Warrior #1 will have a special variant cover featuring the likeness of actor John Morrison who plays the Enternal Warrior in Ninjak vs. The Valiant Universe. Three brothers Gilad, Ivor, and Aram (Later Armstrong) go on an adventure into a mythical land called the Faraway. There Gilad is mortally wounded and killed. Aram tells Ivor he knows of a device in the City of Ur that could bring Gilad back to life called the Boon. The three brothers activate the Boon which kills everything in the city of Ur except for the three brothers. The Boon drained the life force out of everything and everyone and transformed the brothers in various ways. All of the brother became immortal and unaging, each gained super strength, durability and healing. Ivor was taken by a group of in charge of the time stream and became the Timewalker. Gilad and Aram also eventually went their separate ways and did not meet again until many life times later. By 6000 BPC Gilad Anni-Pada had taken on the mantle of Eternal Warrior also known as the Fist and Steel of Earth. He had mastered the weapons of his time and became a master tactician. In this role he is locked in eternal struggle with forces of Earth the Geomancers and the forcers of Nergal a death god who seeks Earth's destruction. In each age the Eternal Warrior has consulted the Geomancers and done their bidding on Earth usually killing, and battling evil forces. A personal disaster struck Gilad when his daughter Xaran killed his son Mitu. Gilad took the death of Mitu hard and blamed his focus on being the Eternal Warrior for his son's demise. Still he continued in the role of Eternal Warrior for centuries until so full of doubt he retired his post. He still continued to fight but not for Geomancers. However, he came to learn that Nergal would return to Earth in 2000 years and that the planet would fall to him unless he retook his post. Gilad has had many adventures and team up since that time including with his own brother Aram who now goes by Armstrong. He also had dealings with with Aric of Dacia aka X-O Manowar. In order to stop X-O Manowar's invasion of Romania Gilad joined forces with the super hero team Unity. Gilad has also been shown having adventures far into the future in 4001 A.D. where he defends a small village in Little Rock, Arkansas. There he unites forces with his grand daughter and a weaponsmith to battle a Nergle Death Cult. The Eternal Warrior is immortal and does not age. His musculature has also undergone a change that gives him enhanced strength, durability and regenerative healing. Has a millennium of experience in combat and is the master of all known weapons. An Enternal Warrior film is said to be part of a 5 film deal between Valiant and Sony. Actor Dave Bautista has commented on the project at least verifying that he is in talks for the role. Dave Bautista is famous for his role as Drax the Destroyer in the Guardians of the Galaxy films. Actor John Morrison will play the Eternal Warrior in the live action web series Ninjak vs the Valiant Universe. Like the Eternal Warrior? What about the other Valiant Characters? Check out the links below for more Valiant.